THE BLACK SIX (1973) — A black high school student has been killed for dating a white girl, and his older brother with the five members of his biker gang, “The Black Six,” seek to avenge the young man’s death. THE BLACK GESTAPO (1975) — When an African-American group in Watts wants to save their neighborhood from the Mafia, they create a People’s Army to protect their citizens. But a second-in-command Colonel soon becomes extremely violent and tries to take control forcing a confrontation with General Ahmed to decide the fate of the squad. BLACK BRIGADE (1970) — Set during World War II, an African-American army company is given orders to destroy an important dam in German territory. But with little combat experience and a prejudiced Captain in charge, the group must rely and fight the common enemy to help the Allies advance and end the war. BLACK FIST (1974) — Young Leroy Fisk is making his living on the streets of Los Angeles as a street fighter and working for a local mob boss. After a big payday from a fight, he buys his own club but soon must faces mob retribution that brings tragedy to his family and a thirst for revenge on those responsible. THE BLACK GODFATHER (1974) — J.J. started on the streets and has worked his way up in the local crime scene. He is on the verge of running all of the action in the inner city except for the Mafia’s hold on the urban heroin trade. Hoping to shake that up, J.J. and his gang have decided it’s an all-out war because everybody wants his body. FIGHTING MAD (1978) — An American soldier on his way home from Vietnam is betrayed and left for dead on a remote island. Rescued by two Japanese soldiers who’ve been holding out since WWII, they nurse him back to health and train him in the way of the samurai allowing him to enact a run of bloody revenge on his tormentors. The six movies is housed on two discs and are contained in a standard DVD case. No features were included. However, there is a code for the Digital Copy, available via Mill Creek’s website. I knew going in these films might not look good, but I didn’t think most of these transfers (most were in 1.33 full frame aspect ratio) were probably taken from VHS sources. They don’t look good at all and is filled with scratches, dust marks and everything under the sun in terms of flaws. The Dolby Digital Stereo tracks themselves also aren’t great though at least the dialogue does come through decently enough but in a few of the films, there were discernible hisses and pops. This Soul Team Six collection might not have top-of-the-line movies, and frankly some aren’t that good, but nice to at least have them in one set even if the transfers weren’t the best. 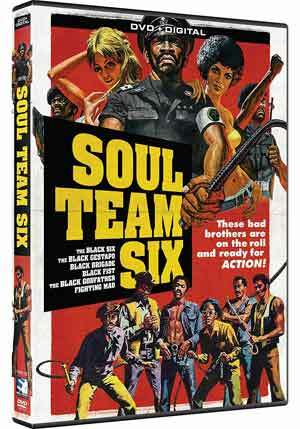 If you’re a fan of the blaxploitation subgenre, this is worth the already low price.